AUSTIN – In 2017, more than 6,000 acres of invasive giant salvinia covered Caddo Lake that was reproducing rapidly due to a warm winter and unusually long growing season. Access for anglers, boaters, and waterfowl hunters became blocked on much of the lake, and hired contractors struggled to keep up with the demand for herbicide treatments due to the sheer size of the growing giant salvinia mats. Two years later, the Texas Parks and Wildlife Department (TPWD) biologists report giant salvinia at Caddo Lake reduced the growth to just over 1,500 acres. Findeisen said the outlook for the 2019 treatment season looks good with much of the giant salvinia flushed out from the recent flooding. For the remaining giant salvinia present in East Texas reservoirs, Findeisen said herbicide applications would do the majority of the heavy lifting to keep it under control. Since September 2017, TPWD and its contractors have treated 18,390 acres of giant salvinia statewide. “We did document some over-winter survival last year, but for the most part we are rebuilding most of the giant salvinia weevil populations,” Findeisen said. 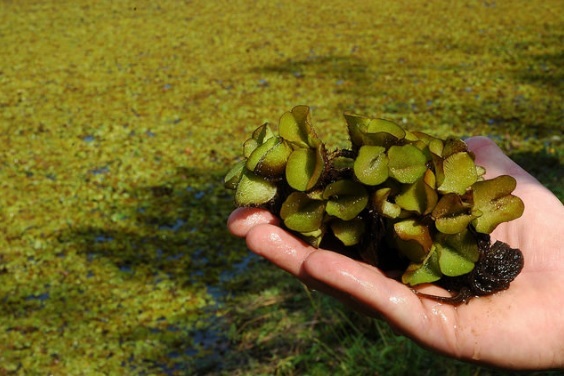 Boaters have a critical role to play to prevent giant salvinia from spreading to any new lakes. Before traveling from lake to lake, boaters need to clean, drain and dry their boats, trailers, and gear to ensure they aren’t transporting any invasive species. A short video tutorial on how to do this properly can be viewed online at tpwd.texas.gov/giantsalvinia. Boaters recreating on one of the 22 lakes infested with giant salvinia should be particularly vigilant about taking these actions. Texas lakes currently infested with giant salvinia include Caddo Lake, Toledo Bend Reservoir, Sam Rayburn Reservoir, Lake Texana, B.A. Steinhagen Lake, Lake Murvaul, Lake Palestine, Timpson Reservoir, Lake Naconiche, Lake Fork, Lake Nacogdoches, Lake Athens, and Martin Creek Reservoir. In Texas, transporting prohibited invasive species is punishable by a fine of up to $500 per violation. Boaters are required to drain all water from their boat and on-board receptacles before leaving or approaching a body of fresh water to prevent the transfer of aquatic invasive species like giant salvinia. Other species of concern in Texas include zebra mussels, floating crested heart, water hyacinth, yellow floating heart, hydrilla, and American lotus.